The Bluefin Tuna is one of the most highly-prized fish used in Japanese raw fish dishes. All around the world, there are a lot of the Japanese Restaurants which serve this kind of dishes using the Bluefin Tuna such as Sushi and Sashimi. We are catching the Bluefin Tuna with the Japanese fishing equipments and the Japanese up-to-date technology. It enables us to enhance the quality and the freshness, valuing the fish. 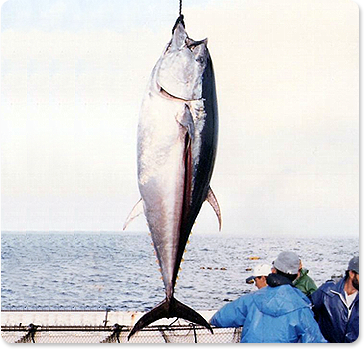 The Bluefin Tuna caught from our set net is processed appropriately in order to keep the freshness. Weighed and put into the styrene foam carton with the ice, and delivered to the airport by our own reefer truck. We have been delivering the Bluefin Tuna directly to the Japanese restaurants in Portugal, and also have exported it to the trading companies in the following countries.